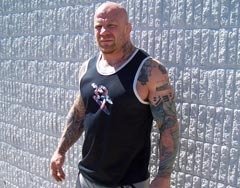 Jeff Monson is among the best in the world in the rising sport of mixed martial arts. At 220 pounds of muscle, the former UFC heavyweight contender believes in exercising free speech as much as exercising his body, a right he claims was difficult to do at the Republican National Convention. "They&apos;re giving us these small little areas to protest. Oh yeah they&apos;re giving us freedom of speech but only in this little area though." This week he claims police trapped his group in a park and arrested 168 of his fellow protestors. However, Monson does not see law enforcement as adversaries but empathizes with them because they are "in the same boat." He considers police officers to be working class people who are competing for the same resources as the rest of us, such as health care and education for their kids. While studying for his master&apos;s degree in psychology, a professor began him down the path to collective anarchism. Although the Florida resident made a special trip to St Paul for the RNC, Monson does not support any political parties especially Democrats and Republicans. He cites Barack Obama as one who speaks of change but he says both parties answer to corporations, a policy which does not help the "average person on the street." The four-time Submission Wrestling World Champion will be traveling to Superior this fall to teach at a jiu-jitsu seminar in which the proceeds will go to St Jude&apos;s.